I’m reading a book right now where the main character tells you what’s happening and then pauses and says, “Okay, full disclosure,” and then launches into what’s really happening–the non-sugar coated version. It’s pretty funny…lots of grins and chuckles. And so, since there’s so much going on internally, I’m going to take a blogging sabbatical. I’ve been loyally publishing a Sunday Morning Coffee blog for awhile, now. Didn’t publish one last weekend…was up in Seattle for a wedding and…well…I sorta, kinda rebelled. Okay, full disclosure. I love writing these blogs, but I need a break from the routine. Disclaimer: If something wow-y zow-y gaddzooks happens, I will be sure to share, of course. And if I go on a trip-of-interest, I will be sure to share, of course. I leave you now with a picture of a dog and her ball. 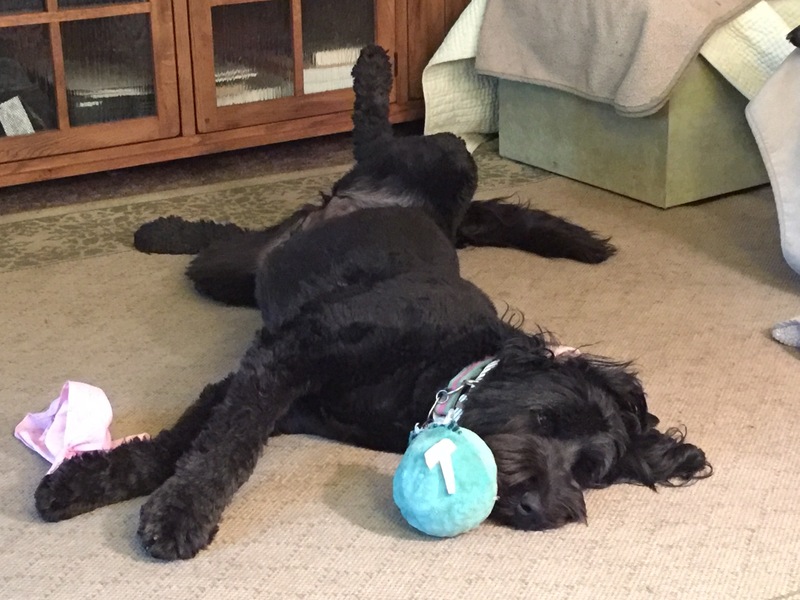 I have no idea why doodles love to chill this way, it’s certainly not ladylike, but it’s something that they all seem to do. Yes, it’s a doodle thing. Well! If you spent your time off as relaxed as your doodle, you should be in fighting form when you’re ready to return! What a darling, silly picture. The Tao of Doodles! Yes…she’s a good teacher, eh? Fighting Form is what I want! I’ll miss your posts but fully support this hiatus!